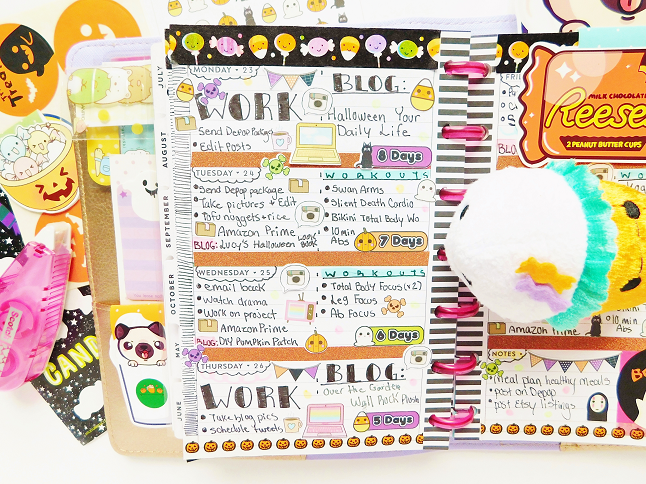 It's the final week of Halloween which means the last week of Blogtober. Technically there are only 2 days of Blogtober left and this is one of them. I didn't share a planner spread last week because I didn't fill out the weekend part of the spread but it's pretty much looked similar as this week's spread. If you enjoyed these weekly spreads let me know so I can post them more regularly. I won't post them too repeatedly but maybe 2-3 times a month would be a fair amount? If you're not a planner addict I can understand these posts might be boring or not be your cup of tea. So let me know your feedback anyways. Here is a brief overview of this week's Halloween spread. 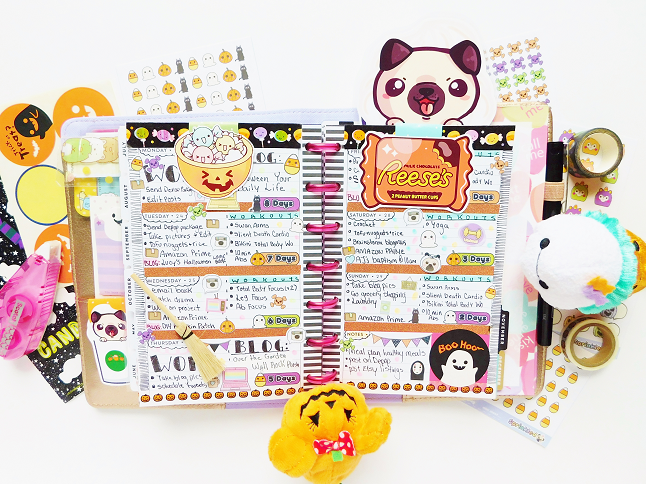 All the magnetic bookmarks and pug page marker are from Hello Paper Cat. 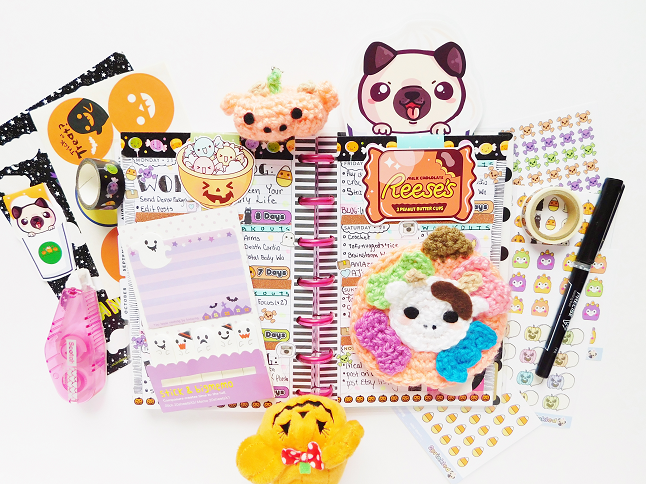 All the sticker (minutes the round Halloween stickers) are from Sprinkled Pug. 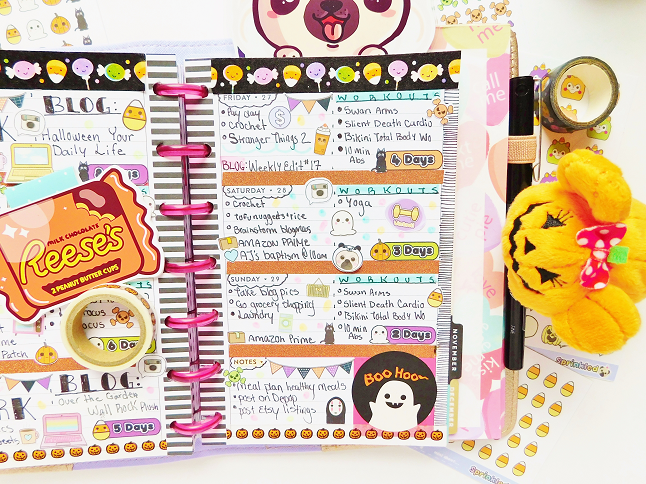 I wanted to make this spread super Halloweeny and pumpkin/orange-like because in case I don't show you my actual Halloween week spread. (I still might tho!). 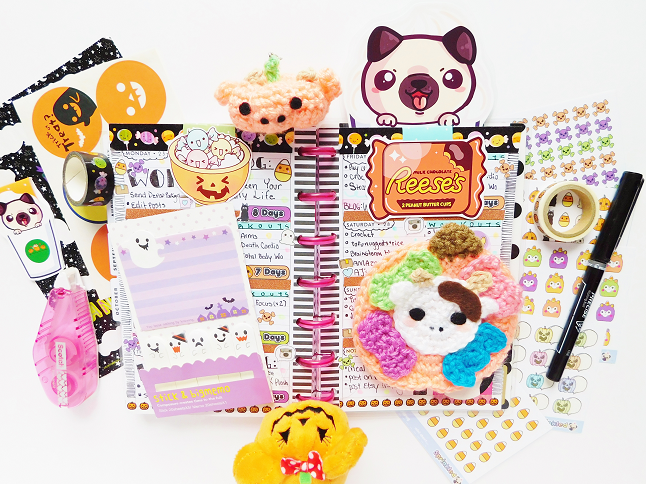 The candy washi tape is from TinyBees, pumpkin washi is from Michael's, and the orange glitter washi is from Target. Here is a close-up of the left side. This week I decided to do something different with the extra space that I have on the days I work. If you saw my previous spreads then you know that I would leave my work days open and not separated with exercise check-list (because I don't work out on days that I work #toolazy). So I decided to try something new and write in my blog post for that day. I'm still not sure if I look this look though. Here is the other side. Not much to say about this side expect that I did forget to bubble in some of my tasks and workouts. That shows how much I look at my planner during the weekend.